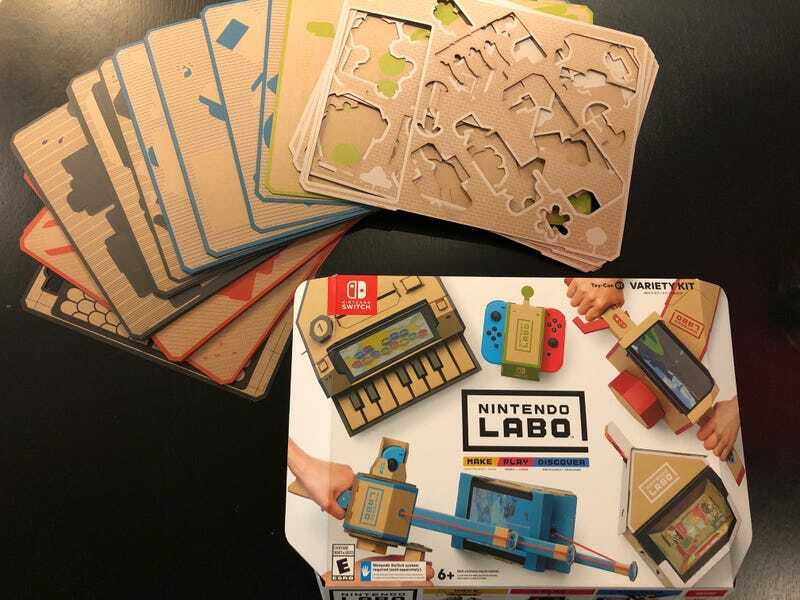 The first question you might have about Labo is: what’s so special about a box of cardboard and some mini-games? And the first thing to understand about Labo is that what’s actually in the box is only part of the appeal. What’s more valuable is what this tiny cartridge and its accompanying sheets of cardboard enable: after-school afternoons and weekends sprawled together on the floor, surrounded by pens and tape, making things and figuring out how they work. 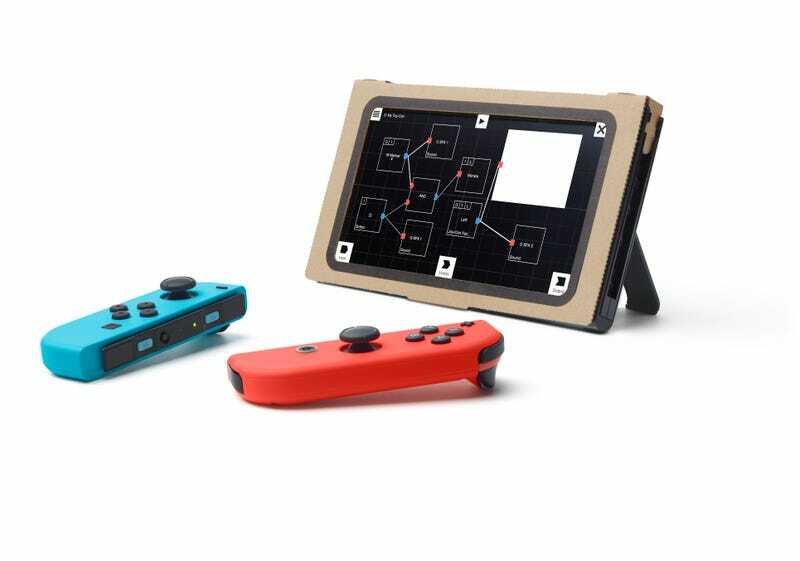 Though the ingenuity and engineering of these models would impress any adult, Labo makes most sense in a family setting. When you combine cardboard and mini-games with the freewheeling imagination of children, they become something more. To review Labo, I checked out the Variety Kit, one of two Labo bundles Nintendo started selling today. The other, the Robot Kit, lets you build a cardboard backpack that connects to games you can control with full body motion. What’s inside the box: stacks of cardboard and (not pictured) a game cartridge essential to making this whole thing work. Right out of the box, the Labo Variety Kit has you building. A brief practice tutorial results in a little Joy-Con holder, and then it’s on to the five models that come in the box: a simple RC car that judders around on a flat surface, controlled by Joy-Con vibrations; a little house with buttons and a crank that slot in; a fishing rod; a minimalist motorbike; a cardboard piano that becomes a fully-functional one when combined with the Joy-Cons and the console. To make the models you follow the Lego-like instructions on the Switch screen, which are clear, comprehensive and written with playful personality. You can then play little games designed for each creation, and dive into a Discover menu filled with accessible tutorials that tell you how they work. Each model takes between half an hour and two hours to build, but you don’t have to stop once the instructions are complete. Customising the models with tape, pens, stickers and whatever other craft supplies you have to hand is a huge part of the fun that exists independently from the software. I turned one RC car into a pig with a pipe-cleaner curly pink tail, and another into a self-portrait with glasses and a mop of bleach-blonde hair. I stopped just short of giving my motorbike a full Triforce themed paint-job. The reel of the fishing rod clicks when turned. The real string extending from the pole becomes virtual string on the Switch screen. As the rod is tilted and twisted, the virtual string reacts, thanks to how the Switch’s controllers communicate with the main screen unit of the portable console. The Labo models themselves are understated marvels. Tabs fit perfectly into slots, intuitive patterning helps guide what goes where, flat cardboard folds into tubes and boxes and slide together, and Joy-Cons nestle snugly in their cardboard holders. Anyone with experience in model-making will appreciate how well-conceived the kits are; it’s even better than Ikea. You can only fully appreciate these models when you make them: a cardboard fishing rod looks cool, but when you’ve put it together yourself, assembling the telescopic rod, wrapping elastic bands round a reel and inserting a cardboard tab so that it makes a satisfying clacking sound, you fully appreciate how it works. The parts of the Switch integrate into the builds well. The Switch screen doubles as the body of water into which you dip your fishing rod, for example. The system’s right Joy-Con nestles into the rod’s handle to employ its sensors to detect the rod’s tilt; the left tracks the reel’s rotation. This is Nintendo as crazed inventors, as Santa’s elves, coming up with madcap ideas for toys and prototyping them until they are perfect. The standout model from this first selection of kits is the piano: not only do the keys work, though you’re limited to one octave, but you can insert different knobs to add reverb and effects. The yelping-cat effect was a favorite. A studio mode even lets you put together simple compositions: you set the tempo by waving the Joy-Con like a conductor, play a tune on the keys, even use a punch-card to map out a drum rhythm and insert it into the top of the piano. The punch-card drum beat blew my mind, and illustrated something unexpected: every time you think you’ve reached the limit of a model and its software, Labo goes ever so slightly further. The RC cars buzz along on a flat surface, controlled by the JoyCons’ vibrations. You can experiment with the frequency to even out the controls or adjust the speed. Because of the infrared camera on the right Joy-Con, the RC cars can unexpectedly see what’s in front of them: you can make them follow an object around, or invent games for them, like setting up obstacle courses in dark rooms. Attaching weapons or digger attachments or big, pointy teeth to the cars is as simple as cutting out some cardboard and sticking it on, enabling Robot Wars-style battles. The fishing rod and motorbike models rely more heavily on the software packaged with them. The motorbike unlocks races around pretty simple circuits that you can motor around at different speeds, and the fishing game is simple but fun, increasing in difficulty the deeper you sink your line. The house turns into an eccentric dolls house, with different buttons and dials that attach to its sides and become taps, microwaves or light-switches on the Switch screen. None of the Nintendo Labo games has enormous longevity. If you want to go down the rabbit hole, you can enter the Toy-Con Garage and start inventing your own stuff and messing with the JoyCons’ functionality. 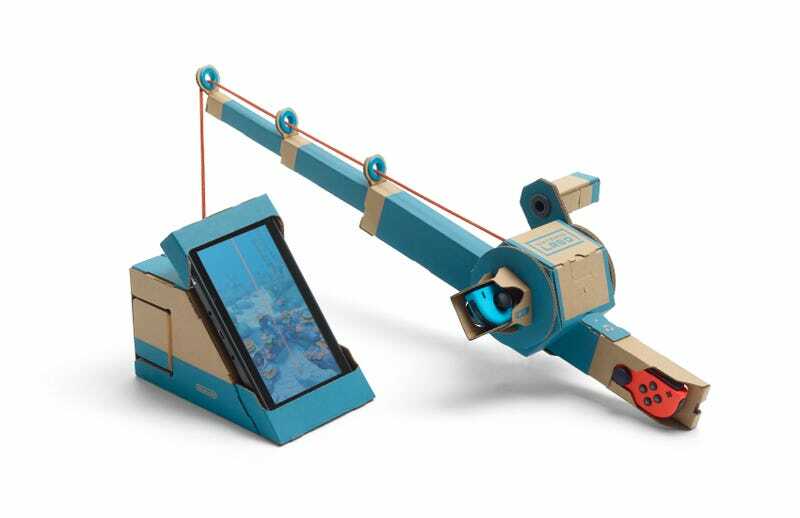 I imagine that most players will be perfectly content making and playing with what’s in the box, but Nintendo-produced videos show tantalising glimpses of what can be achieved: cardboard guitars and drums, simple gun games. In a few months I have no doubt that we will see some incredible creations from the maker community. The Toy-Con Garage mode encourages users to program custom interactions involving the Switch’s screen and sensor-filled controllers. This is essential to making a Labo construct. Labo does not try to hide the magic that powers these models. The Discover section has unpatronising but child-friendly explanations of everything from how the JoyCons work to what an accelerometer does to basic programming: a curious kid could go as deep into this as their curiosity took them. (“You don’t need to be smart to come here,” reads one of the tutorials: “It’s the things you learn here that make you smart.”) The info is presented through three cartoon characters that specialise in programming, cardboard customisation and play, reflecting the “play, create, discover” elements of the Labo. There are also bits of Switch and Nintendo trivia hidden away in there: I learned that the joy in Joy-Con has a double meaning: “joint controllers,” for joining to things. 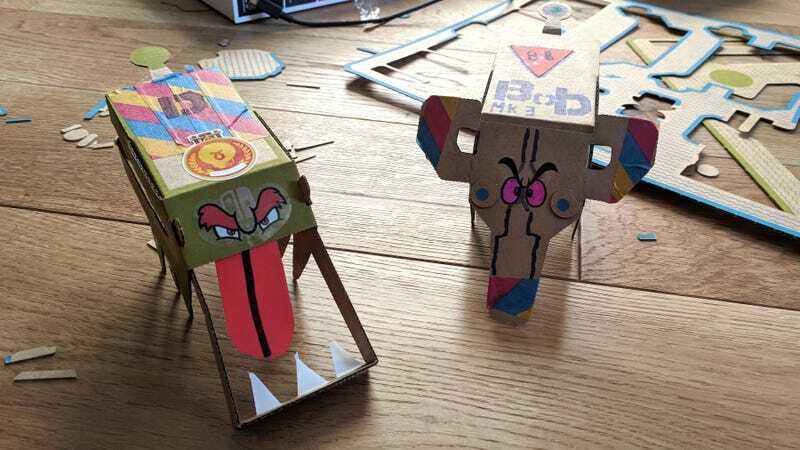 At age 1, my own son is rather too little to understand the appeal of either video games or arts and crafts, so I borrowed some big kids for an afternoon to see how they responded to Labo. Naturally they needed more time to build the models than an adult (especially one with an embarrassing amount of experience with fiddly Lego constructions), but they became much more absorbed in customixing the models afterwards. An hour was spent refining the RC Car creations, Dan and Bob mk 3. Kids and adults get different things out of Labo, depending not just on age but personality. The more complex models might lose the attention of younger children, but older ones (and parents) will be driven to find out how they work. It is very much a family activity, because whether each person is most interested in playing games, making the models, coming up with new inventions or customisations, or delving into programming principles, everyone has something to offer. One of the great fallacies of children’s entertainment is that kids need things to be simple. Kids love diving deeply into complicated things, accumulating knowledge that is out of reach of the adults around them. Nintendo has always understood this, but Labo is a unique expression of this understanding, something that extends beyond the virtual world. More of a madcap engineering kit than a game, it feeds and rewards creativity and curiosity. As an adult, you’re along for the ride, but if you’ve got imaginative children in your life, seeing how they respond to this marvellous toy factory will be a great joy.